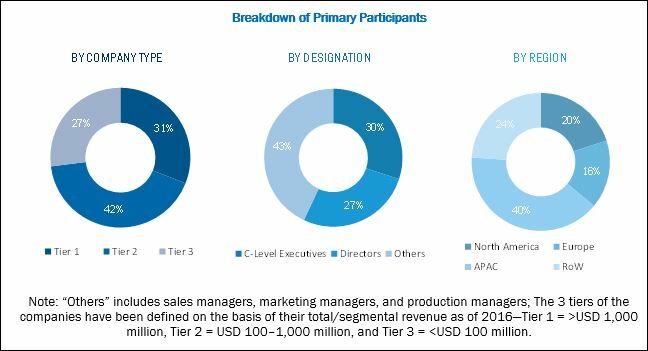 [149 Pages Report] The positive material identification (PMI) market is expected to increase from USD 1.82 Billion in 2017 to USD 2.89 Billion by 2023, at a CAGR of 7.79% between 2018 and 2023. The base year for this study is 2017, and the forecast period is between 2018 and 2023. Study the complete value chain and allied industry segments of the PMI landscape. During this research study, major players of the PMI ecosystem in various regions have been identified and their offerings, regional presence, and distribution channels have been understood through the in-depth discussions. To find the overall market size, top-down and bottom-up approaches have been used to estimate the market size of other individual markets by using percentage splits obtained from the secondary sources, such as Hoovers, Bloomberg Business, Factiva, and OneSource, as well as primary research. The entire procedure includes the study of the annual and financial reports of the top market players and extensive interview with the industry leaders, such as CEOs, VPs, directors, and marketing executives, for key insights (both qualitative and quantitative) pertaining to the market. The following figure shows the breakdown of the primaries on the basis of the company size, designation, and region conducted during the research study. The PMI ecosystem comprises a raw material and component suppliers for analyzers, PMI analyzer manufacturers, network of regulatory bodies, accreditation and standards organizations, third-party PMI service providers, research and development (R&D) institutions, manufacturers, technology integrators, and distributors. Olympus (Japan) and Thermo Fisher (US) are the top-ranked equipment providers in the PMI market, while SGS Group (Switzerland), and Bureau Veritas S.A. (France) are the top-ranked service providers in this market. The prominent companies in the PMI market include the well-established, financially stable, and technically strong players that have been operating in the industry for several years and have diversified product portfolios, service offering, proprietary technologies, and strong distribution networks through mergers and acquisitions. Note: The PMI equipment market is further segmented on the basis of technique and form factors. Thus, these 2 segments do not concern the PMI services market. 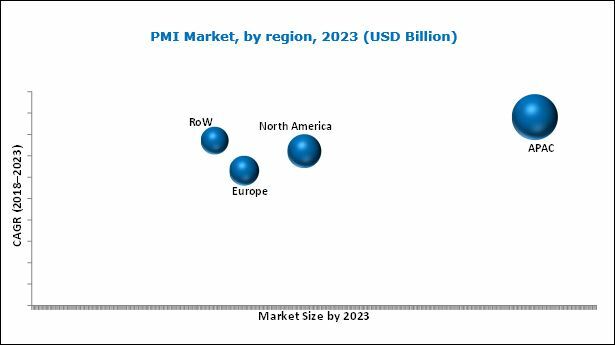 The positive material identification (PMI) market is expected to grow from USD 1.99 Billion in 2018 to USD 2.89 Billion by 2023, at a CAGR of 7.79% between 2018 and 2023. The growth of this market is mainly driven by stringent safety regulations by governments and quality control requirements, declining efficiencies of aging assets and the subsequent need for operational safety, and innovative technological advancements in PMI equipment. XRF accounted for a larger share of the PMI equipment market, based on technique, in 2017. XRF is a widely preferred analytical technique for PMI owing to the portability of XRF analyzers. This analyzer is highly suitable for solids, liquids, and powders. XRF analyzers are widely used and mainly referred as a rapid characterization tool in many analytical labs across the metallurgy, forensics, polymers, electronics, archaeology, environmental analysis, geology, and mining applications, among others. Portable analyzers accounted for the largest share of the PMI equipment market, based on form factor, in 2017. The wide adoption of portable analyzers is attributed to the low price and small form factor. Portable analyzers can analyze any part of any shape, such as plates, pipes, flanges, welds, and valves, along with other components in a specific system. These analyzers are mainly used in the applications such as gold testing, ore grade control, mineral exploration, soli analysis, metal recovery, and geochemical mapping. The oil and gas industry held the largest share of the PMI market in 2017. In the oil and gas industry, the prevention of the release of highly hazardous chemicals and toxic substances is of prime importance. Moreover, incurable accidents and damages, pipe leakages, premature pipe replacements, property damage, and unplanned outages at sites (such as refineries, chemical plants, and gas processing facilities) are some of the major issues faced by these facilities. These issues arise as a consequence of the use of faulty or forged metal building components, sulfidic deterioration of piping and critical equipment, or use of materials that do not meet the required specifications. PMI analyzers assist in checking the necessary parameters of these components and piping. Thus, the demand for these analyzers is likely to increase in the oil and gas industry. In terms of regions, Asia Pacific (APAC) accounted for the largest share of the PMI market in 2017. Countries in APAC are involved in the manufacturing of defense aircraft, which is expected to increase the adoption of PMI methods in the aerospace and defense industry. Many infrastructural development projects are under construction in this region and are scheduled to be completed during 2018–2023. The demand for automobiles in this region is estimated to grow by 2023, which would result in the need to increase the manufacturing of vehicles. To address this need, the companies have to perform optimally, and the implementation of PMI methods can help achieve this.